There is a wealth of published clinical data available on the relevancy and correlation of coronary calcium and heart disease. Dr. Blanchet has produced a CD entitled “Heart Scans”, which summarizes current medical data, as well as his own results, regarding managing positive calcium scores in his patients. Interestingly, it mostly involves proper nutritional supplements and other simple lifestyle modifications. Dr. Bill Davis, cardiologist, has written a popular book, “Track Your Plaque” which also discusses this topic. Dr. Blanchet’s “Heart Matters” CDs are available at Front Range Preventive Imaging or at Amazon.com. Key word search: Dr. Bill Blanchet. The CD’s are available individually or as a set. They are perfect for listening on car rides and give you the most up to date information on proactive health in an easy to understand and enjoyable format. This, and the other CD in the series “Heart Matters”, “Beyond Cholesterol”, explains everything we need to know about heart disease detection and management, and even reversal, in an easy to understand, engaging format. Guidelines and recommendations published on what to do with calcium scores are readily available to help both patients and physicians make effective decisions on management of known heart disease based on calcium scoring. Front Range Preventive Imaging continually provides this type of relevant information to patients and physicians. This is true, and this is why a baseline heart scan for everyone is crucial to the detection and treatment of heart disease. Your first heart scan tells you if you have heart disease or not. Your second heart scan tells you if the plaque that you have is calcified (stable), or if it is unstable or non-calcified. How does the second scan do this? If a positive calcium score does not increase by more than 15% in a 12 month period, then the existing plaque is stable and is very unlikely to rupture. If a positive calcium score increases by more than the 15% annually, the plaque is considered unstable or growing and may have the potential to rupture and cause problems. Basically, the only heart scan more important than your first one is your second one. This is wrong. There are few, if any, false positives with a heart scan. This idea was initiated by physicians who were not familiar with heart scans. When their patients came to them with positive calcium scores, the “knee-jerk” reaction was to send the patient for an immediate stress test. The patient would pass the stress test and the physician would say the heart scan was a false positive. Many people, some of them very famous, had fatal heart attacks shortly after a scenario such as this. Their heart scan shown they had potentially dangerous plaque. The stress test merely showed they had good blood flow. The technology has been used at universities and hospitals since the mid-1980s. There are several hundred articles in various medical journals demonstrating the accuracy and utility of this procedure. 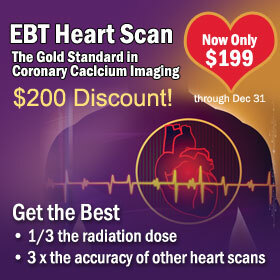 Many of the world’s leading universities and heart hospitals routinely scan individuals with the Gold Standard, Electron Beam Tomography (EBT) scanner. There are data banks referencing the results of millions of heart scans. 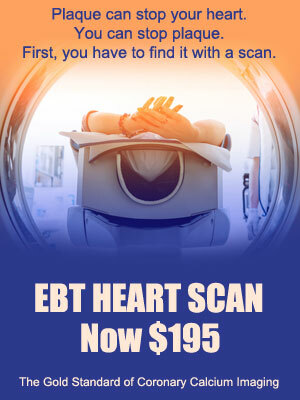 And, if this is not enough, just ask someone whose life was saved because they got an EBT heart scan. This too is very wrong. Knowledge is powerful. A calcium score of zero provides a sense of relief and well-being that your life style is supportive of good heart health. Any score greater than zero can be looked at as even better news because you now have the opportunity to be proactive in stopping and even reversing your heart disease. There are supplements and medications available that can stabilize plaque and lower risks of ever having a heart attack. Some people will need more attention to other life style modifications such as diet, exercise, sleep, gum disease, etc. Whatever the score, the goal is stability.